At this time of the year, I nearly always wear these, even if it is a training ride. Although quite expensive for an overshoe, I’m a big fan of this. Buying a second pair is always a good sign. Easy to fit on shoe. I leave it on the end of the toes when taking shoes off and then just pull up ankles when putting shoes on. It gives a reasonable protection from shower and spray. If it rains heavily, you feet will definitely get wet. But, then I’ve never come across an overshoe which can 100% keep your feet dry. It is useful for light showers or days when there is spray from the road. It does enough to keep the feet a bit drier and prevent wet feet for a little longer. They give some warmth protection, especially in wet conditions, they help avoid the coldness from damp. They also help keep out the wind coming through cycling shoes built for hot conditions. In mild conditions, it’s just a bit extra insulation, whilst remaining breathable and light – For days when a proper neoprene overshoe would be overkill, these can keep the edge off whilst it’s still cold in the morning. 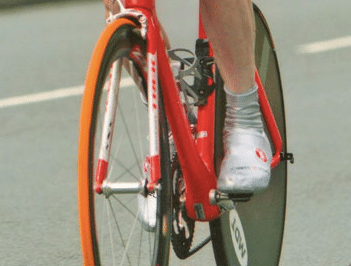 They help improve aerodynamics, useful if your time trialling. 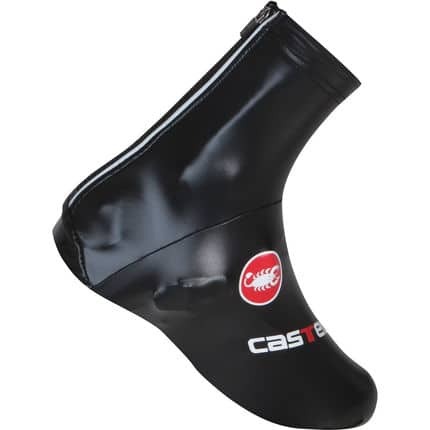 If it is a big race, I will use the much more expensive Smart overshoes (£85) but for less important races, I use the Castelli Nano because they are cheaper and I can protect the £80 from overuse. They are pretty sturdy for an overshoe. Over the years, I’ve tried many overshoes and find that they are prone to disintegrate pretty rapidly. I’ve tried wool based overshoes, but they tend to rip and shred quicker than this rubberised lycra. To say they get a lot of use, they have done well to last nearly two years. You can’t really expect thin overshoes to last any longer.